Saline water used in the process of oil production has leaked from flowlines in Saskatchewan more than 120 times since the beginning of 2017, according to the Ministry of Energy and Resources. 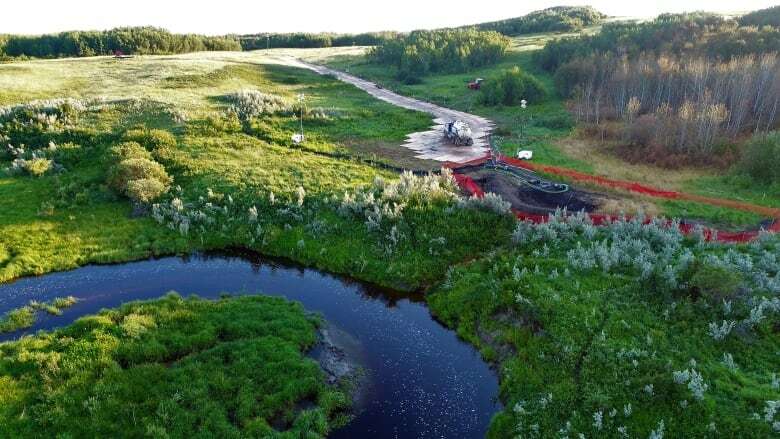 Saline water used in the process of oil production has leaked from flowlines and pipelines in Saskatchewan more than 120 times since the beginning of 2017, according to the Ministry of Energy and Resources. Last Wednesday, Husky Energy discovered a breach in one of its salt water lines had leaked an unknown quantity of salt water into the ground. It happened on a Saskatchewan farm near Turtleford, northwest of Saskatoon. Aerial photographs show a wedge of dead trees and vegetation where the leak appears to have travelled downhill. According to the ministry, 121 incidents involving the release of produced water from a flowline or pipeline have been reported since the beginning of last year. Of those, three came from Husky Energy. The leaks varied in size. "Produced water is generally saline but to varying degrees depending on [the source]," the ministry said in an emailed response to questions. 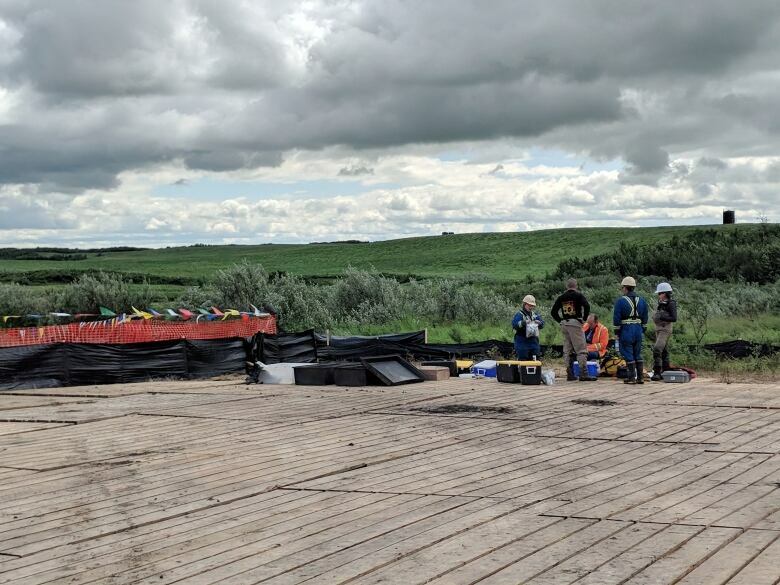 Husky Energy said salt water is responsible for the impact to vegetation near Turtleford but testing to determine what was in the water and any damage to the soil is still ongoing. It was discovered on Wednesday but the company does not yet know when it started or how deep the salt water went into the ground. 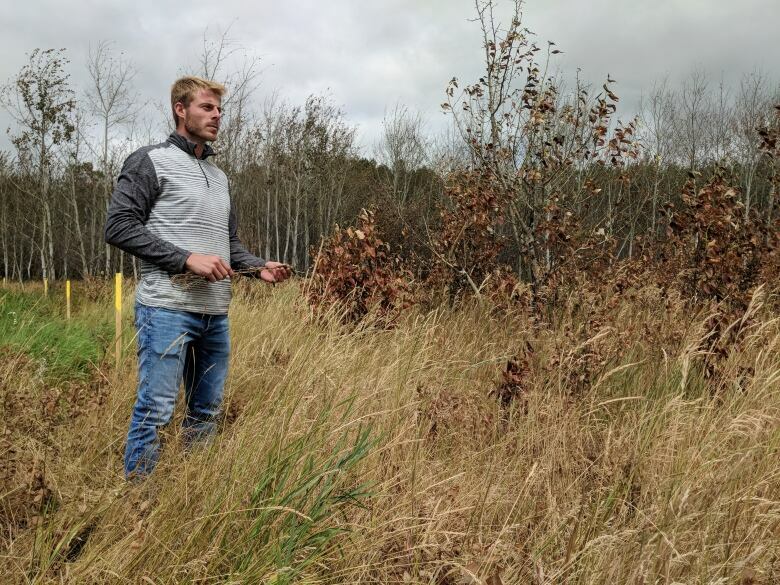 Grant Ferguson, an associate professor of geological engineering at the University of Saskatchewan, has been researching oil field brines in Saskatchewan for several years. He said saline water produced by the oil industry in some parts of Saskatchewan can have salinity up to about eight times higher than water in the ocean. Ferguson said the number of leaks that occur in western Canada is surprisingly low considering the amount of water that is being transported by the oil industry. "Oil companies are actually water companies in a way," he said. "The amount of fluid they move around, some of it's oil but in a lot of cases a lot of that is water." Ferguson's research is focused on the possible long-term impact of oil industry transportation of brine water in western Canada. While public discussion often focuses on issues like fracking and major pipeline projects, Ferguson believes issues such as salt water, old leaking wells and aging infrastructure could be some of the most serious in the long-term. "This is what we're going to have to deal with and perhaps this should be of greater interest to the public," he said. Leaks from pipelines that go un-noticed and malfunctioning water disposal wells that could affect shallower groundwater are among the possible consequences, he said. The Ministry of Energy and Resources said it is investigating the cause of the leak. It said there is no regulated age limit on pipelines or flowlines in Saskatchewan because age is not the best indicator for risk of failure. "A 50 year old pipe that has been properly maintained and protected may be in better condition (low risk of failure) compared to a pipeline that is only a few years old but operated [poorly]," the province said in an email. 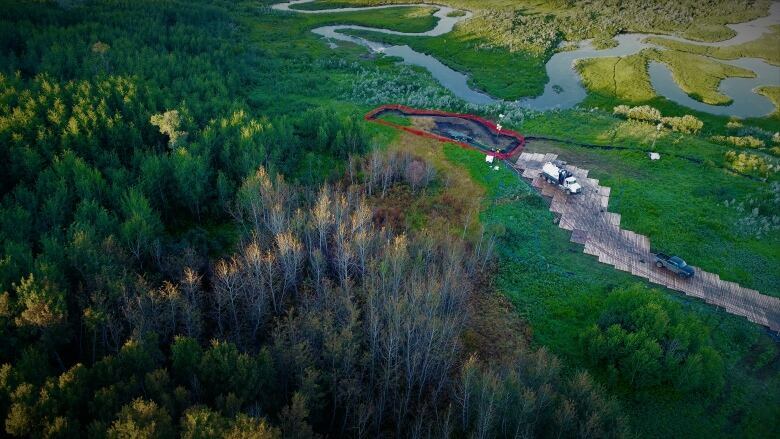 Husky Energy said in an emailed response to questions on Tuesday that it will not answer questions about when the pipeline was last inspected — or how often it was inspected — until after it has finished an assessment of the leak. The Ministry Of Energy and Resources said brines associated with oil production are subject to a "wide variety of directives and regulations." Nick Wourms, whose family owns the land where it happened, spoke out on the weekend about the damage to his land. Wourms was critical of the company's handling of the incident, saying Husky had "underplayed" the damage when they notified his family. Husky said it had two meetings with the family on Monday. "We've had a good relationship with the landowner over a fairly long period of time and we regret we didn't do a better job of communicating with him in the early stages of this incident," said Husky spokesperson Mel Duvall. The company said it has not found any hydrocarbon contamination from the water in the nearby Englishman River. Husky is required to submit a report to the ministry identifying the cause of the line failure, and the steps it intends to take, within 90 days of the incident. The province said its own engineers will examine that information, along with its own findings, to determine if further action is required.